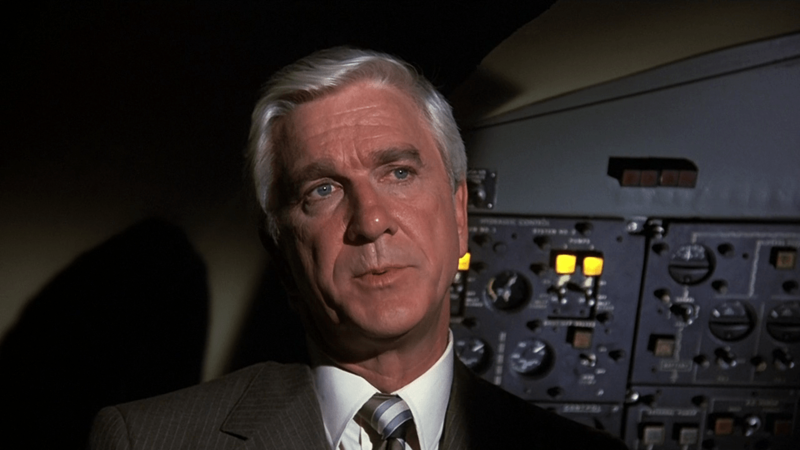 Revival House: "And don't call me Shirley ..."
Thirty years ago, Airplane! arrived in theaters, changing spoof comedy, Turkish prisons, and jive-talking old ladies forever. I suppose it’s fitting that the follow-up to my Jaws tribute is about a movie that begins with an airplane tail fin emerging from beneath clouds, accompanied by a certain instantly recognizable John Williams giant-shark theme. It’s a movie that reinvigorated the subgenre of comedy known as the spoof and also effectively ended the ’70s disaster genre as we knew it. 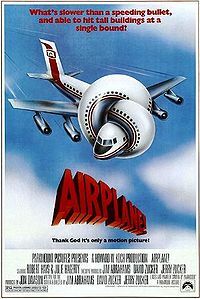 It is of course Airplane!, which opened 30 years ago, on July 2, 1980. In the early ’70s Jim Abrahams and brothers David and Jerry Zucker were writing sketch comedy for their Kentucky Fried Theater group in Madison, Wisconsin. Searching for ideas, they accidentally taped a late-night showing of 1957’s Zero Hour! off of a local TV station. The film stars Dana Andrews as Lieutenant Ted Stryker, a WWII fighter pilot who attempts to land a commercial airliner after the pilot succumbs to food poisoning. Sound familiar? And so the inspiration to do an airplane-movie take-off (I swear that pun was not intended) was firmly planted in the trio’s minds. They wrote a screenplay, but were unable to sell it at the time. Zucker-Abrahams-Zucker, as they’re collectively known, went on to write The Kentucky Fried Movie (1977), a series of sketches, fake film trailers, and commercial parodies directed by John Landis. For their next project, which would turn out to be Airplane!, they fought for the opportunity to direct their own script. In Airplane! just about every disaster-movie cliche is given its due, including, but not limited to, the singing nun, the girl in desperate need of an organ transplant, the passenger who must attempt to land the plane while being guided by the control tower, and, in one of my favorite bits, the panicky passenger who requires a slap in the face to calm down. It’s not just disaster-movie cliches that take a hit. 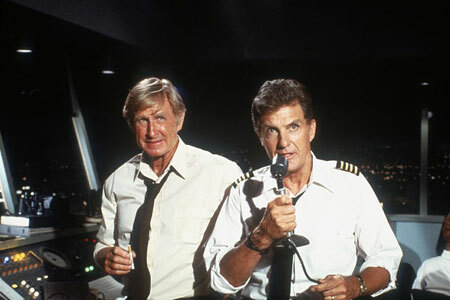 There are also send-ups of standard film cliches like the obligatory bar fight, the cranky control-tower supervisor who picked the wrong week to quit smoking, the fighter pilot who’s traumatized by events from the war and now has a drinking problem, and — another of my favorite bits — characters who remove their glasses just prior to saying something Very Important. But wait, there’s more. On top of all that, Zucker-Abrahams-Zucker mix in some flat-out comedy with their satire, like good old Abbott-and-Costello “Who’s on first?” confusion regarding the names of the gentlemen in the cockpit, the curious case of the man who thinks he’s Ethel Merman, and — yet another of my favorite bits — the lady who can translate jive, played by Leave It to Beaver‘s Barbara Billingsley. Not all of the gags work, but there’s so many of them it doesn’t matter. If any joke fizzles, rest assured there are a half dozen more coming in the next minute. What makes this all work is the casting of serious actors rather than comedic actors — Robert Stack, Lloyd Bridges, Peter Graves, and Leslie Nielsen, to name a few. Their roles are played straight, which makes it even funnier. Nielsen, in fact, became known primarily as a comedic actor after Airplane! Composer Elmer Bernstein enjoyed a career resurgence in the 1980s as a go-to guy for scoring comedy films; the key was that he never scored them with “funny” music. In interviews Bernstein, who died in 2004, credited John Landis with hiring him for National Lampoon’s Animal House (1978) and asking him to score it as if it were a drama. Hilarity ensued, and Bernstein went on to compose the scores for Stripes (1981), Ghostbusters (1984), and Landis’s Spies Like Us (1985), among many others. For Airplane! he was asked by its three directors to write a “B-movie” score, as opposed to a “good” score. The end result is that I’ve never laughed so much during a movie, before or since (though others have come close). Abrahams and the Zuckers went on to direct Top Secret! (1984) together, while David Zucker directed two of the three Naked Gun movies and Abrahams helmed the two Hot Shots films in the ’90s — funny stuff, yet none of them touched the magic of the trio’s directorial debut. In fact, their best movie after Airplane! wasn’t a spoof at all, but rather the straightforward comedy Ruthless People (1986; directed by the trio but written by Dale Launer). Maybe I should write a concluding paragraph now. No, that’s just what they’ll be expecting me to do!